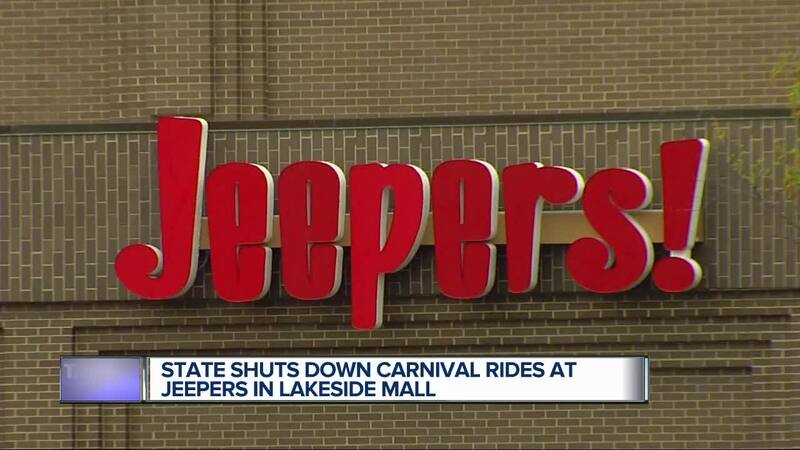 Jeepers of Lakeside Mall has been ordered to immediately stop operating four carnival rides because they are unsafe, according to the latest state inspection. The Michigan Department of Licensing and Regulatory Affairs has issued a Cease and Desist order against Jeepers for operating hazardous and unsafe carnival rides. Jeepers of Lakeside Mall has been ordered to immediately stop operating four carnival rides because they are unsafe, according to the latest state inspection. The Michigan Department of Licensing and Regulatory Affairs has issued a Cease and Desist order against Jeepers for operating hazardous and unsafe carnival rides. Lara cited the following rides for multiple safety violations of Michigan’s Carnival-Amusement Safety Act: Banana Squadron; JJ’s Driving School; Python Pit and Yak Attack. They are all located at Lakeside Mall. The order permits Jeepers from operating the rides until violations have been corrected. failure to properly inspect and document daily inspections of rides. The order also notifies Jeepers that violation of the Act may lead to administrative, civil, and criminal sanctions.